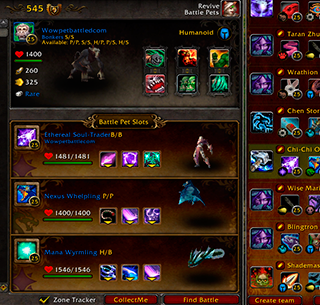 Teralune is one of the new Grand Master Pet Tamers of WOD. Start with the Sunreaver Microsentry. We have alot of prep time in the start of this fight, as his first move will be a stun follwed by cocoon. Once you have Extra Plating up, the cocoon will give you first move, so use Super Charge. From here its Pew Pew Laser spam untill hes down. The Second pet is going to start with Call lightning, so make sure you re up Extra Plating before killing the first pet. After he drops call, use Supercharge on cool down and spam Laser. With Attonement in play, the Sunreaver should have almost taken all three pets by himself. Its just a rinse and repeat cycle. If Sunreaver went down, the switch was easily the Bronze Whelp. As an S/S breed, he will make quick work of the last pet. Use Early Advantage when you can and Arcane Slash spam. Watch the video for the Kill!